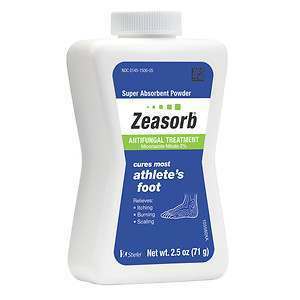 This review of Zeasorb Athlete’s Foot has been written to help customers make a knowledgeable decision about whether to go for this product or not when it comes to treating athlete’s foot. Zeasorb Athlete’s Foot is a powder that contains the active ingredient Miconazole Nitrate (2%) which helps in treating fungal infections. The product is not available on its website but has mentioned that the product is available in many leading stores as well as on leading online shopping websites. Read on to know more about the ingredients that are used in this powder as well as if it’s effective enough to treat the infection. The directions on how to use the product have not been provided on the product’s website’s homepage but is found in one of the sub sections. Clean the affected area and dry thoroughly. Then apply a thin layer of the product over affected area twice daily (morning and night) or as directed by a doctor. One should pay special attention to the spaces between the toes, wear well-fitting ventilated shoes, and change shoes and socks at least once daily. It is supposed to be used every day for 4 weeks. The cost of the product is not available on the website, but on other shopping websites the cost is $5.59. There are no discounts or offers available for the product. There is no guarantee being provided by the manufacturer regarding the product and there are no customer reviews that are provided on the website to substantiate the claims being made by the company. The customer reviews that are available on other shopping websites are positive and encouraging. People are happy with the performance of this product and recommend using it. Zeasorb Athlete’s Foot is a product that has good customer reviews and in another section to be found on the product’s website is the FAQ section which consists of a lot of videos by doctors who explain ways of treating athlete’s foot as well as discuss in detail the causes of this infection. The detailed analysis helps in providing answers to questions related to the infection. However, when it comes to providing information about a money back guarantee as well as the quality of the product, it fails to provide any answers. This can make a prospective customer unsure about whether to go ahead and purchase this product. There are no instructions on how to use the product on the product page of the website nor is there any list of ingredients provided on the website except the mention of Miconazole Nitrate (2%). The bottom line is that before purchasing the product, one should consult a doctor regarding the product as the lack of information regarding other ingredients can cause unnecessary problems in the future. Jimmy Rodriguez	reviewed Zeasorb Athlete's Foot	on November 19th	 and gave it a rating of 2.5.